The S&P 500 (SPY) finished lower by 0.61% and continues to have a strongly bullish intermediate posture according to the Market Forecast indicator. 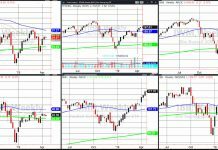 All major U.S. stock market indices have strongly bullish intermediate postures and bullish intermediate confirmation signals. The Dow Jones Industrial Average’s bullish intermediate confirmation signal appears to be the most actionable when taking into consideration the near-term and momentum line placement. The NASDAQ Composite held up the best on a relative basis falling today by only 0.56%, which is consistent with the outperformance of technology-oriented firms recently. All U.S. equity indices closed with a “3 Green Arrows” signal but the Russell 2000 still isn’t trading above a rising 30 day moving average. The Russell 2000 is on the verge of a bullish crossover using the 10 week moving average versus the 40 week moving average but traders will need to wait until Friday’s closing price for confirmation. The Sector Selector shows Technology stocks leading the pack for the 4th straight week and the rankings of Discretionary and Communications sectors also bounced higher.